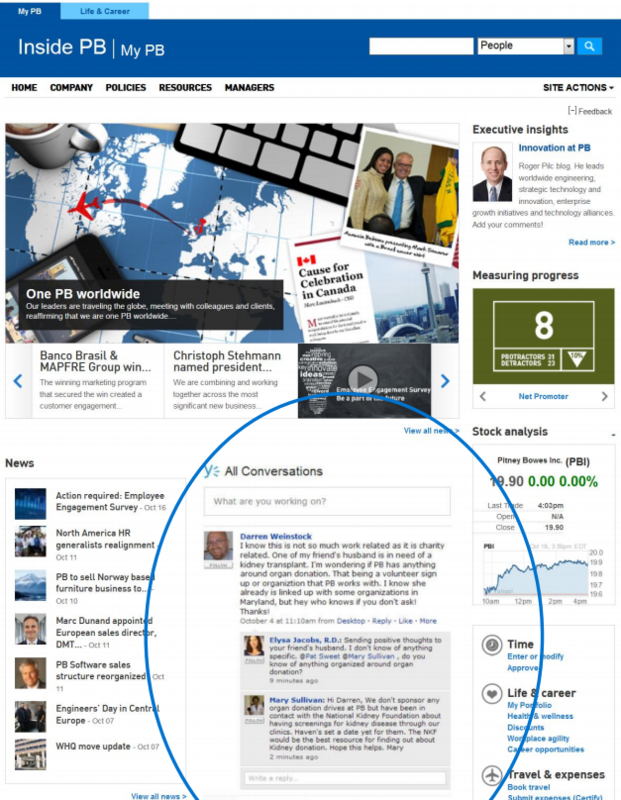 At Pitney Bowes, Corporate Communications was able to increase readership to intranet news articles by 300% by promoting individual articles in Yammer newsfeeds. Although, news articles still appear on the Pitney Bowes intranet home page, social media activity streams via Yammer are driving users to the news. Although few organizations are rushing to do-away with home page intranet news, intranet social media represents a revolutionary shift in corporate communications and collaboration, and an opportunity for organizations to increase employee engagement by raising emotional capital. MIT’s Sloan School of Management believes that intranet social media (ISM) initiatives must first focus on development of emotional capital, a dimension of social capital. Fun (The feeling of playfulness employees experience when experimenting with new things at work). Holtz cites Jochen Specht, Manager of Web Strategy at Siemens, writes an internal blog on the intranet, and every fifth blog post is on soccer (football). “And management doesn’t care (about the occasional personal or social post) as long as he is getting his work done,” adds Holtz. “If we’re expecting employees to change behavior at work, then employees need to see executives are changing their behavior,” says Shel. Buy in – rationale and ROI, investment, culture change. Accountability – Subordinates’ behavior, reward and recognition. Participation – Not optional; adoption depends on developing emotional capital. Conversations are also paramount to success: technology is just an enabler, while the conversation between people is key. Conversation is paramount to good communications. Holtz cites the Harvard Business Review (Leadership is a Conversation, June 2013), that the best leadership communications flows from conversation. “We know there are about ten or 20 frequently asked questions we get on Twitter. So we looked at those and thought about how we could give a reply that wasn’t boring text only,” says “Joseph Sikorsky, head of digital media at NatWest. Innovative or not, social or not, most organizations need to find a balance between the push and pull of home page content on the intranet. Employees want content and tools that are relevant to them; a pull of information based on their profile and/or preferences. Most organizations, and executive management do require a ‘push’ of information in addition to the pull; executives have key messages, strategic initiatives, and mission-critical imperatives that frontline employees may or may not care about, but need to be front-and-center in the communications mix, and the intranet home page. Finding a balance between push and pull is important, and not easily attained without explicit research and understanding of employee and management needs and concerns. Remember: most organizations are not a democracy, but most employees understand this and don’t expect the home page to be exactly what they want, when they want. For most, home page news is not disappearing, but will be further enhanced by both push and pull information flows and tools. Fantastic blog as usual Toby. Your right on spot with the devaluing and disengagement of home page news on the intranet. We have seen this transition with our customer base over the last few years utilizing more content feeds and employee-based personalization on their intranet profile pages. Our Lead Support Technician, Ayendra Susanthan wrote a terrific blog about the 6 Elements of an Intranet Homepage that discuss these principles (http://www.ragan.com/Main/Articles/6_things_every_intranet_home_page_must_have_48340.aspx). Also, we have seen an uptick in multi-media content sharing to produce more interact intranet content. Our Sales Engineer, Maz Mohammadi, produced a terrific blog on how this is best utilized on an intranet (http://www.intranetconnections.com/blog/harnessing-benefits-intranet-media/). I love to see that our team is on the same wavelength as you Toby.